Antigua and Barbuda can be a promising direction for successful work in the VoIP termination. The mobile communications services market is well developed here, and the average rate is quite high (it is about 10 cents per minute). But for a stable income it is important to connect to reliable Internet. 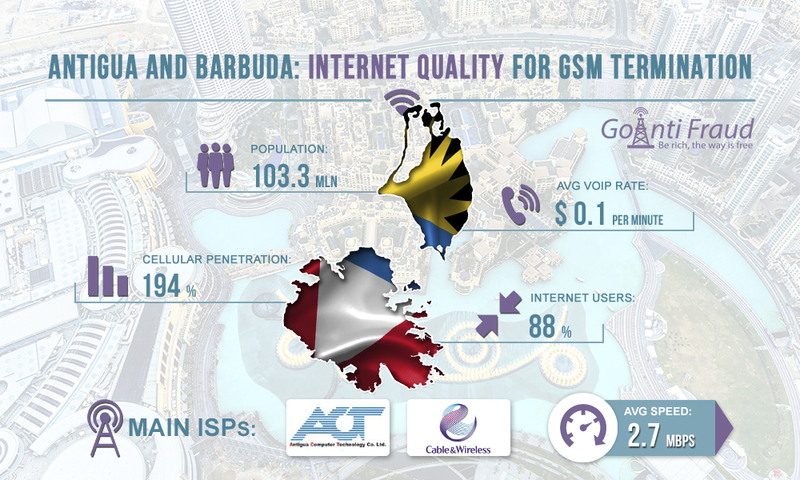 Antigua and Barbuda currently demonstrate an intensive development of network technologies. The main Internet providers include Cable & Wireless, Antigua Computer Technology (or ACT). They provide the possibility to connect to the Internet of almost any type (DSL, Wi-Fi, fiber-optic, etc.) To date, the Internet penetration in the country has reached 88% (this is approximately 81.9 thousand connections). As for the average Internet speed in Antigua and Barbuda, this figure makes up 2.7 Mbps. This is a fairly low value for normal operation of the gsm gateway multiple sim. To ensure smooth operation of VoIP equipment, we recommend connecting to the Internet at a speed of 5 Mbps. Despite a rather low average rate, the island provides an opportunity to connect to a higher speed Internet. To improve your Internet bandwidth in Antigua and Barbuda, use the SBO traffic optimization module from GoAntiFraud. In addition to the fact that it compresses the traffic by 3 times, thereby providing a higher connection speed and savings on Internet payments, it also allows you to hide your activity on the network. Thus, you will be able to run your business as efficiently and safely as possible.